Sharp MX-M905 | The Miller Company, Inc. The Sharp MX-M905 high-speed monochrome document systems offer advanced technology and features that will streamline your document workflow like never before. 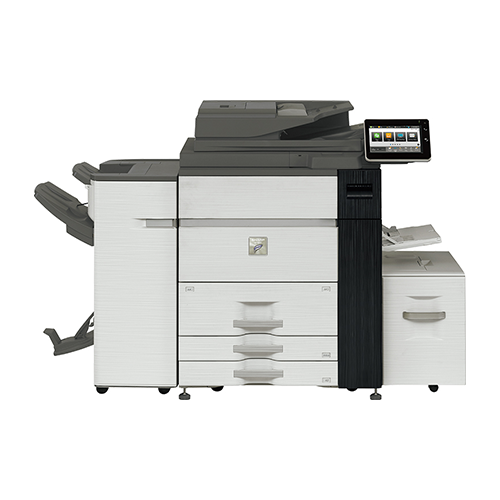 From walk-up office environments and corporate workgroups, to Central Reprographics Departments (CRDs) and copy rooms, the MX-M905 provides world-class efficiency with intuitive operation. These high-powered document systems have been designed to handle the rigors of high volume environments with the user friendliness of a workgroup MFP. These workhorses are a perfect fit where productivity and reliability are critical and ease of use is essential.